There can be some confusion when it comes to choosing whole wheat or whole grain and the differences between the two. 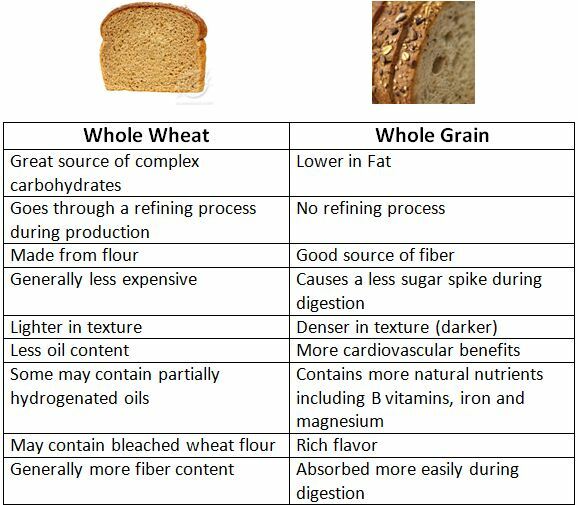 Whole grain and whole wheat look very similar. Sometimes I cannot tell the difference between the two without tasting them. Whole grain has a richer taste than whole wheat does. Whole grain has a more darker texture than whole wheat does. One of the main differences between whole wheat and whole grain is the process used to prepare the grain flour. With whole-wheat flour, the grain has gone through a refining process that has removed some of the nutritional value . However, whole-grain flour does not go through this refining process, and maintains the natural level of nutrients. I have done some research and created a chart which distinguish both at a glance. All in all, in my opinion Whole Grain bread wins in this battle. Some may argue, however eating any food that hasn’t gone through a refining process is always better over processed food in my eye. Also for those who want to try and minimize sugar spikes will choose whole grains over whole wheat. Nice one. I believe in keeping nutrition as real and as close to the source as possible to gain the best possible benefit from food. I especially liked the graphic organizer you took the time to create…very helpful. Thanks a lot, I’m glad you liked it. I’m all about whole natural foods as well! Whoa! You know, I’ve always had the debate in my mind on which one is better than which. It’s like butter versus margarine (hint, hint! Haha). I’d go with whole grain too. I’ve also read that rye and pumpernickel are good picks too, though they have very peculiar flavors. Great post! Will follow! thanks…that’s a very useful post indeed. My vote goes to whole grain as well…just takes a bit getting used to though. Glad you liked it! Yea it does takes some getting use to. But once your on you love it. If I’m out and they ask me whole wheat or grain. I always say grain now! Thank if you learned something then I have done a great job then!! Glad you liked it! Yes you are absolutely on the right track. Great Job. Nice chart! I have been hooked on Squirrelly bread, It’s an all natural bread that is Vegan friendly (I am not a vegan). The bread is made using using sprouted grains. I find one piece at 110 calories is all you need for a sandwich it is so filling and chalked full of Fibre. Glad you found the chart useful. I will check out the link because I have never heard of it before. Always try anything once! Glad you enjoyed it! Congrats on the journey to eating cleaner. It makes the world of difference! Thanks a bunch Kim! Glad you liked the chart and I hope it helped! Nice to know! I usually go with whole grains because of the higher fiber content, but I don’t really eat much bread in general. If I do consume grains, it’s usually in low carb tortillas, oats, cereal, etc.. I’ve kind of learned to eat the stuff people put in sandwiches (meat, cheese, veggies) in salad form, and when you do that, you don’t really miss the bread anymore. Thank you so much for visiting this topic. Many people don’t even realize there is a difference between these two, and it is important to know all your options, especially with a food we turn to so often for quick and easy meals. great post and it helps people tell what is best when it comes to bread. We eat so much of it and it is a staple in American food. I like to bake my own bread, then I know what is in it. For dark bread instead of corn sugar I add molasses, and always use whole grain flour. Slicing it is tricky and you need a bread knife, and practice slicing a regular sized piece. Super helpful article. However, you have ‘more fiber content’ listed under both. Glad you posted this, I’ll be grabbing the whole grain bread from now on. Thanks for the clarification. I have heard that whole grain is “better,” but I didn’t know exactly why. My only frustration is that not many stores offer many (if any) whole grain bread options. I also like the taste and texture of “grainier” breads. Love the detail there! Thank you! Youre right about that! I am glad you liked the post. Very useful post…always read the labels. Whole wheat in quotation marks is never a good sign and High Fructose Corn Syrup has no place inside a human. To junkmile: I love squirelly bread!. So when looking at the ingredients list, should a bread say “whole grain flour” as the first ingredient? Reblogged this on Sandra Does Life. You know, it’s funny. I remember reading so long ago that you should always look for “whole wheat” over “whole grain” in ingredients and translated that to breads of course. I can’t remember exactly why but I feel like it was something about it being refined. This was a great read because sometimes you get stuck in one mindset that either isn’t true now or maybe wasn’t ever true at all. Very informative. I learned something today. I didn’t know about that, I just eat any bread. lol! now i know what to buy, but, yeah, it’s difficult to distinguish which is the right one. Anyway, thanks for the follow. Have a blessed day! Interesting! I admit one thing you may have forgotten, the whole grains breads taste much much better…but maybe thats a personal opinion. Yum. Bread. This article is very helpful. Now I know the difference. I prefer whole grain. Hey there!! You’ve been nominated for the Very Inspiring Blogger Award because I’m enjoying Your blog thoroughly and you are among my favs. 2) Link back to the person(s) who nominated you. 3) Reveal seven things about yourself. Amen on this one man. Took me nearly 60 years to get this figured out. Good work. And thanks for putting it out there. Awesome! No problem. I had a hard time with this when entering the healthy lifestyle. Glad you liked~! What are your thoughts on sprouted bread? Have any graphic organizers for that? 🙂 Thanks for a great post. Nice one! As a Finn who considers whole wheat and whole grain bread as “white bun”, I’d go for rye bread. The darker the better 🙂 http://en.wikipedia.org/wiki/Rye_bread. Ever tasted?